The Trustees of the National Galleries of Scotland, 1998, Paperback. Condition: Very Good+. A very nice copy of an uncommon title. First in this, paperback, edition. 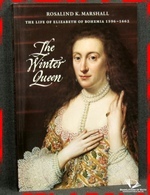 Illustrated by way of: Colour Photographs; Genealogical Tables; Published for the exhibition The Winter Queen - The life of Elizabeth of Bohemia held at the Scottish National Portrait Gallery, Edinburgh 10th July – 4th October 1998. Size: 9¾" x 6½". 111 pages.